Many parents worry about their children being bullied, but what about your child being the bully? There are many who say “that won’t happen to mine,” but how do you know? It’s up to you to give your children the tools to be a good friend and respectful member of society. 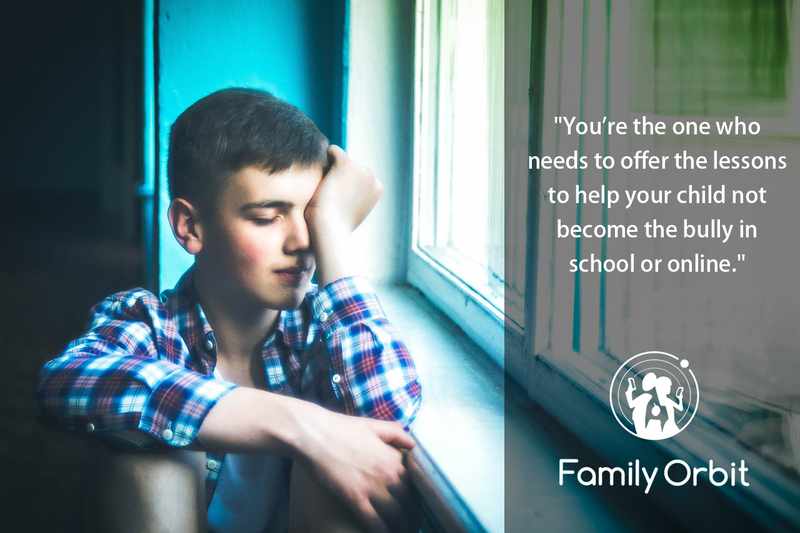 You’re the one who needs to offer the lessons to help your child not become the bully in school or online. With cyber bullying on the rise, there’s a greater chance of children becoming the bully to others. Here are the necessary tips to help teach your child this is not what you expect. Start by teaching them all about empathy. Not everyone has the skills right away, but they can learn. Empathy is the ability to understand the feelings another person has. They don’t feel sorry for them, but can relate to them. When you’re upset, how do they react? Can your children understand that feeling? How about when you’re hurt? Teaching them about empathy can greatly reduce the risk of them cyber bullying someone else, or hurting someone physically. Unfortunately, children who bully tend not to understand how their actions hurt. They don’t relate to that pain and torment, and instead find it funny. It’s up to you to make it clear that that isn’t acceptable. One of the ways to help your child understand empathy is to discuss the feelings of how others have been treated. There are many news reports at the moment of children committing suicide because of cyber bullying in particular. Discuss the reports with your children, and go through the feelings that the victim must have had to get to that point. It’s important not just to focus on the victim, but also the families of the victims. Talk about the aftershock that happens, and how it could affect others in the family. It’s very easy for the good behavior to go unnoticed. Children get used to hearing their parents shouting, so you need to turn that around. It’s important to praise the good behavior. This doesn’t mean you always have to give treats and rewards, but praising will help to make it clear that you are happy with the positive feelings. Your child will want to hear that more, and will start to act in good ways; helping out around the house and being more empathetic to people. It’s especially important to praise when your child has been empathetic. This can be a difficult lesson to learn. Sometimes just knowing that he or she is on the right track is enough to stay on it for the long term. There are lots of movies, TV shows and video games that show violence is the way to solve issues. Some will show that being the victor means inflicting pain and suffering, and it’s time to limit these in the house. It’s not possible to get rid of all of them, but try to cut down the amount your child partakes in. Limiting computer and TV use is good for your child anyway. Encourage reading books suitable for their ages—ones that limit the violence—and playing outside with friends. The less time they spend online, the less chance they have of cyber bullying. It really is up to you to teach your children not to be a bully. You can do this by focusing on feelings, and how actions affect others. Teaching empathy is just the first step. It’s what you do after that. Keep praising that positive behavior and try to limit the negative, violent movies and video games from the house. Parents can help to bring cyber bullying levels down.